Some call his era the “Age of Santa Anna.” He was known as a brave soldier and a cunning politician. Over his forty-year career, he served multiple times as a general and eleven times as president of Mexico. He thought of himself as “the Napoleon of the West,” yet historians say he was among the many leaders of Mexico that failed the nation. His political endeavors and his military failures resulted in Mexico losing over half its territory in the American west, first to Texas after its revolution in 1836 and finally to the United States in 1848 after the Mexican-American War. Antonio López de Santa Anna was born in 1794, the son of middle-class criollos (persons of Spanish descent born in the Americas) in the Spanish province of Veracruz. His family had enough money to send him to school for a time, but at sixteen, he became a cadet in the Fijo de Veracruz infantry regiment. For five years he helped police Indian tribes and fought against insurgents, including filibusterers from the United States who were trying to free Texas from Spain. Many historians believe that this early period of Santa Anna’s military career shaped his ideas of how to put down rebellions through a fierce policy of mass executions, which he later used during the Texas War for Independence. As a member of the Royalist army, the dashing young man, who used his charisma to charm acquaintances, fought for a while on the Spanish side as Mexico began its eleven-year war for independence from Spain. However, as he did throughout his military and political career, he realized his best interest lay in switching sides to join the rebel forces fighting for independence. All during the turbulent 1820s as coups ushered in first one and then another president, Santa Anna changed his allegiance to whoever was clawing his way to the top, quickly rising through the ranks while gaining the reputation as a valuable if treacherous ally. In 1829 Santa Anna achieved what some claim was his greatest (and perhaps only) military victory when Spain made its last attempt to regain control of Mexico by invading Tampico. Santa Anna, who was good at stirring up emotions and quickly rounding up an army, led an expedition that defeated the Spanish force. The invading army was suffering from yellow fever, but the defeat was real and Santa Anna emerged as a national hero. Without hesitation, he branded himself “The Victor of Tampico” and “The Savior of the Motherland.” More coups followed, accompanied by presidential exiles and executions, until the new Congress of Mexico elected Santa Anna as president on April 1, 1833. Despite having run as a liberal, within a year Santa Anna claimed that the country was not ready for democracy. He dissolved Congress and centralized power, turning his regime into a dictatorship backed by the military. Liberals all over Mexico felt betrayed and several states began to defy the new authority including citizens in Texas y Coahuila, which was the northernmost state in Mexico that would eventually become the Republic of Texas. The Texas settlers, who were mostly from the United States, had received generous land grants from the Mexican government and were demanding more fair treatment and the return to the original liberal terms they had received during colonization. Several open rebellions occurred along the Texas coast, at Nacogdoches, and finally at Goliad. When citizens in Zacatecas also rose up in December 1835 in defiance of Santa Anna’s new authority, he moved quickly to crush the resistance and allowed his army to loot the town for forty-eight hours. Then he marched his army at top speed through winter cold to San Antonio where he raised the red flag of no quarter and demanded the surrender of the Texans, whom he called “land thieves.” The thirteen-day siege ended with the killing of all the inhabitants of the Alamo fortress except for some women, children, and slaves. The next demonstration of his intent to dominate the rebellious citizens occurred at Goliad when he ordered the execution of over 300 captives who had surrendered on the battlefield to General Urrea. Despite Urrea’s letter requesting that the honorable surrender be recognized, Santa Anna sent word that they should be executed as pirates. On the morning of March 27, 1836, the prisoners who could walk, were marched in several groups away from the Goliad fort and shot. Those who had been injured in the battle were killed inside the compound. When word spread of the Massacre at Goliad, people who had thought of Santa Anna as cunning and crafty, realized that he was indeed cruel and the realization fueled an infusion of volunteers from the United States to help the Texans fight for independence. Santa Anna continued to march eastward intending to kill or drive across the Sabine River all the Texas land thieves whom he held in such disdain. His amazing ability to hastily round up an army had never been tested at such long distances from the center of Mexican supplies or in the bitter cold and rain of that Texas spring. He did not have ample food or supplies for his men, and as he chased the rebels across Texas, his nemesis, General Sam Houston, had the towns burned and supplies destroyed as Texas settlers fled in terror before the advancing Mexican Army. Oil on Canvass, Santa Anna displayed in Mexico City Museum. Still confident of his superior force and determined that his military skill would win the day, Santa Anna left half his force on the banks of the Brazos River as he raced eastward to catch the officials of the interim Texas government and then defeat the ragtag army of Texas volunteer farmers and merchants. When the two armies finally met on the banks of Buffalo Bayou on April 21, 1836, Santa Anna grossly underestimated the fury and determination of the Texans to repay the Mexican Army for the slaughter at the Alamo and at Goliad. In fact, as the Mexican Army enjoyed its afternoon siesta, the Texans using two cannons that had only recently arrived from citizens of Cincinnati, Ohio, raced across less than two miles separating the camps and in an eighteen-minute battle defeated the startled Mexicans. Despite their victory, the furious Texans continued killing the Mexicans until 630 lay dead and 730 were taken prisoner. The Texans lost nine. loss of Texas, deposed him in absentia and did not recognize his authority to give up Texas. Santa Anna was not finished. After a time of exile in the United States, he eventually made his way back to his estate in Veracruz. In December 1838 the French landed in Veracruz after the Mexican government refused to reimburse French citizens for their financial losses in Mexico. Ironically, the government gave Santa Anna command of an army with instructions to defend Mexico by any means necessary. In typical Santa Anna fashion, the assault failed, Mexico was forced to meet French demands, but Santa Anna managed to turn the disaster to his advantage. He had been hit by cannon fire in his leg and hand, and his leg had to be amputated. He returned to politics as a hero of the war, touting his sacrifice for the motherland. He even had his amputated leg buried with full military honors. He served again as acting president the following year and helped overthrow the government in 1841 to become dictator for the next four years. During his reign, he sent military expeditions into the Republic of Texas, which convinced many Texans that annexation to the United States would give them powerful protection. However, his autocratic rule fomented so much resistance that he was forced to step down and was exiled to Cuba. Santa Anna found another chance to return to Mexico with the United States annexation of Texas, which resulted in the Mexican-American War. He made a deal with President James Polk to allow him to enter Mexico through the United States naval blockade in exchange for getting a negotiated settlement of land for the United States. At the same time, he was making that deal, he was arranging with Mexico’s president to lead an army against the northern invaders. Reneging on both agreements, as head of the army, he marched to Mexico City and declared himself president. Again, his military prowess failed, and when the United States won victory with the capture of Mexico City, Santa Anna retired to exile in Jamaica. Mexico’s loss gained the United States more than 500,000 square miles––westward from the Rio Grande to the Pacific Coast. It is hard to believe that even the conservatives, who wanted a central government under the control of the army and the Catholic Church, would invite Santa Anna back. But, that is what happened in April 1853. This time his administration was no more successful than before. He declared himself dictator for life, funneled government funds to himself, and sold more Mexican territory to the United States in the Gadsden Purchase. His “Most Serene Highness,” as he called himself, finally became too powerful even for his conservative friends. A group of liberals, led by Benito Juárez, overthrew him and he fled again to Cuba. When the new government discovered the extent of Santa Anna’s corruption, he was tried in absentia for treason, and all his property was confiscated. Santa Anna roamed from Cuba to Colombia, to St. Thomas and to Staten Island, New York, where he came up with the idea of selling chicle––the sap from the Mexican sapodilla tree––as an additive to natural rubber. He planned to use his new wealth to raise another army to take over Mexico City. To fulfill his scheme, he worked with Thomas Adams a photographer, glassmaker, and inventor, who may have served as Santa Anna’s secretary. Adams bought one ton of chicle from Santa Anna and tried unsuccessfully for a year to use it to make carriage tires. Adams had observed Santa Anna chewing the chicle and began to experiment with the substance, eventually creating what became “Chiclets” chewing gum––a windfall from which Santa Anna failed to benefit. Meantime, in 1874, after Mexico issued a general amnesty, Santa Anna returned, a crippled old man who was almost blind from cataracts. He had written his memoirs while in exile and spent the last two years of his life virtually ignored by the Mexican government. “The Napoleon of the West” died in Mexico City on June 21, 1876. Cincinnati to Nacogdoches, which was still part of the Mexican state of Coahuila y Tejas. Marquis James, Houston’s biographer says in The Raven that Anna’s father Henry Raguet was a merchant and landowner. He provided the best house in Nacogdoches for his family where they entertained extensively. Anna, the apple of her father’s eye, played the French harp in the parlor and translated Spanish, especially for the young men in the area who wanted to improve their correspondence with the Texas Mexican government. And like the forty-year-old Sam Houston enjoyed the company of the charming Miss Anna. To clear the way for a serious courtship, Houston hired a divorce lawyer who failed to get the decree because divorce was against Mexican the law. Even as Houston began his law practice, hobnobbed with Nacogdoches society, and became deeply involved with the political faction seeking Texas independence from Mexico, he pursued his courtship of Anna through letters and his gentlemanly manners. Houston was the hero of the day after San Jacinto and easily won election as the first president of the Republic of Texas. In the midst of the challenges of organizing a new government, he did not return to Nacogdoches for several months. Instead, he worked out of a shack on the banks of the Brazos River in the temporary capital of Columbia and continued his courtship of Anna Raguet by mail. She had ignored the laurel of leaves and card sent from the battlefield of San Jacinto. To avoid gossip that would surely reach her in Nacogdoches, Houston refrained from socials engagements as much as possible and stayed away from alcohol. Houston’s biographer claims that Dr. Robert Irion, a gentlemanly young physician who had practiced medicine in Nacogdoches and had been elected to the First Congress of the Republic, accepted Houston’s appointment as his Secretary of State. Dr. Irion worked closely with President Houston and had even listened to Houston’s worries about the scarcity of mail from Miss Anna. When Irion went home to Nacogdoches on a short leave, he carried Houston’s letters to Anna. In early 1837 Houston wrote Irion: “Salute all my friends and don’t forget the Fairest of the Fair!! !” Again Houston wrote: “Write … .and tell me how matters move on and how the Peerless Miss Anna is and does! I have written her so often that I fear she has found me troublesome, and … .I pray you to make my apology and … .salute her with my … .very sincere respects.” While Houston waited for letters that did not come, he received regular reports that Miss Anna was nearing the steps of the altar, although no one seemed to know who the fortunate fellow might be. Ignoring the laws of the Republic of Texas that required an Act of Congress to secure a divorce, President Houston empowered a judge to quietly hear the case in his chambers and issue the decree. The version of the divorce story that Anna Raguet received was apparently all it took to settle any doubts she may have harbored. The one-sided romance came to an end. Dr. Robert Irion, upon hearing the news, promptly persuaded Miss Anna Raguet to marry him. The nuptials took place in March or April of 1840. The couple had five children, and they named their first son Sam Houston Irion. 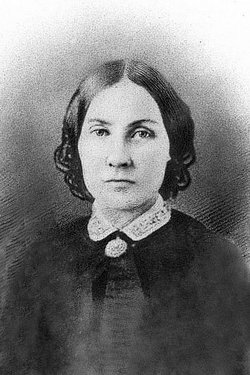 Houston’s Cherokee wife died in 1838 and two years later Sam Houston married his third wife, twenty-one-year-old Margaret Moffette Lea. They had eight children, the youngest born just two years before Houston’s death in 1863. She steps onto the scene as the woman accompanying Capt. Telesforo Alavez when his ship from Matamoros, Mexico, landed at Copano Bay on the middle Texas coast about the same day as the fall of the Alamo on March 6, 1836. Variously called Francita, or Panchita, or Francisca, those who met her assumed she traveled as Capt. Alavez’ wife; however camp women regularly followed the Mexican army, and later research disclosed that Capt. Alavez had abandoned his wife and children in Mexico the previous year. When Francita arrived at Copano Bay, she discovered that General José de Urrea’s army held prisoners who were bound so tightly that the cords cut off the circulation in their arms. Several of those men remember her as the beautiful Mexican lady who convinced the guards to loosen the bonds and give them food. As he headed to San Antonio and the Battle of the Alamo, General Santa Anna split his forces, directing Urrea’s army to move toward Presidio La Bahía, an ancient fort housing 500 militia, the largest collection of men in the Texas army. It is unclear which route Capt. Alavez took with his cavalry regiment as he moved from the Texas coast to join Gen. Urrea’s forces. Some accounts claim a priest and “a Mexican lady named ‘Alvarez’” convinced Gen. Urrea at San Patricio to save the lives of twenty-one captives and ship them back to prison in Matamoros, thereby ignoring Santa Anna’s repeated orders to shoot all prisoners taken in arms. While Urrea continued his march toward Presidio La Bahía, the commander at the at the old fort, Colonel James W. Fannin, ignored orders from General Sam Houston to abandon La Bahía and join forces with Houston’s ragtag volunteers as they moved ahead of Santa Anna’s advancing army. Fannin delayed for five days before he began a slow march out of the presidio, only to be overtaken in mid-afternoon by Urrea’s rapidly advancing force. The Texans and the Mexicans fought valiantly until darkness fell. Without sufficient water for cooling their cannons or to ease the suffering of the injured, and without the hoped-for reinforcement by the next morning, the Texans chose surrender. Despite the decree that Santa Anna pushed through the Mexican Congress the previous December, which directed that all foreigners taken in arms against the government should be treated as pirates and shot, General Urrea appealed to Santa Anna for clemency for Fannin and his men. Urrea’s force moved on to capture nearby Victoria while about 240 uninjured or slightly wounded were marched back to Presidio La Bahía under the direction of Col. José Nicolás de la Portilla. Colonel Fannin who had sustained an injury and about fifty more severely wounded were moved back to La Bahía over the next two days. Again, Francita appears as a comforter of the suffering, intervening to improve care for the prisoners crowded into the presidio’s 85- x 25-foot Chapel of Nuestra Señora de Loreto. Soon, more prisoners from other battles arrived to increase the population to over 500. A letter from Santa Anna arrived on March 26 demanding that Col. Portilla carry out the orders to execute the prisoners. Two hours later, Portilla received a letter from Urrea imploring him to treat the prisoners with respect, especially Col. Fannin. Despite being torn between conflicting orders, Portilla continued with plans to execute the prisoners at dawn the next morning––Palm Sunday, March 27. The prisoners were marched out in three groups––some believed they were going to gather wood, others expected to drive cattle, another group thought they were headed to Copano Bay for shipment to freedom in New Orleans. Another account, written years later by Benjamin Franklin Hughes, who at age fifteen had served as an orderly, claimed that his group believed they marched toward embarkation and return home. He saw Urrea’s wife and a young lady he called “Madame Captain Alvarez” watching the groups move out. As Hughes marched past, the ladies directed that he be taken from the ranks and placed between them. Within minutes, by a prearranged signal, the massacre began, and Hughes realized the women had saved his life. Although Francita accompanied Captain Alavez on to Victoria, she continued to send messages and supplies to the surviving prisoners at La Bahía. The grandson of one of the Victoria families preserved stories of the wives of Mexican officers throwing themselves in front of a firing squad, successfully halting the execution of three or four prisoners. After Texas won independence from Mexico and captured Santa Anna in the Battle of San Jacinto on April 21, 1836, the Mexicans began a slow retreat. Captain Alavez evacuated his Victoria post and returned to Matamoros where Texans told of “Señora Alavez” ministering to the prisoners. After she followed Captain Alavez on to Mexico City, he abandoned her. Returning to Matamoros penniless, she found friends among the Texans who remembered her kind treatment. However, none of the people who told the story of her humanitarian deeds ever bothered to accurately record her name. What Happened to the Twin Sisters? In November 1835, three months before Texas declared its independence from Mexico, war clouds had grown into a full rebellion and the citizens of Cincinnati, Ohio, eager to lend support, began raising money to purchase two cannons for the looming battle. Since the United States remained neutral throughout the war, the two iron six-pounders were secretly shipped down the Mississippi River labeled “hollow ware.” Stories abound about how they actually reached Sam Houston’s volunteer army camped about seventy-five miles up the Brazos River from its mouth at the Gulf of Mexico. Most accounts say the cannons traveled from New Orleans aboard the schooner Pennsylvania to Galveston where Dr. Charles Rice’s nine-year-old twin daughters Elizabeth and Eleanor were invited to be part of the official handing over of the cannons to Texas. Since the ceremony consisted of twins presenting the two cannons, the six-pounders became known as the “Twin Sisters.” The Pennsylvania continued to the mouth of the Brazos River and traveled inland about eighteen miles to Brazoria. Houston’s camp lay an additional sixty miles upriver. According to an account taken from General Houston’s correspondence and orders, worry over the terrible condition of the roads and concern that Santa Anna’s army might intercept the Twin Sisters resulted in the decision to ship the cannons back to Galveston. Over the next eleven days, the cannons moved through Galveston Bay and up Buffalo Bayou to Harrisburg (near present Houston). Then, horse-drawn ox-carts slogged through the rain, mud, and fiercely cold weather to General Houston’s campsite on the Brazos River. As soon as the Twin Sisters arrived, nine men drew assignment to each cannon and the drilling and firing practice began as the Texan Army moved east along the same route the Twin Sisters had just covered. Sam Houston’s army of about 900 men set up camp on April 20 in a thick growth of timber where Buffalo Bayou flowed into the San Jacinto River. The Twin Sisters spent the afternoon in their first combat dueling with Santa Anna’s Mexican cannons. The following afternoon the Twin Sisters led the charge across the rise in the prairie toward Mexicans who, convinced the Texans would not dare attack, were enjoying their usual siesta. At 200 yards the two little cannons opened fire with the Texans’ only ammunition––musket balls, broken glass, and horseshoes. The battle cry of the Texans’ split the air with “Remember the Alamo, Remember Goliad.” In eighteen minutes the startled forces of Mexico’s superior army had been defeated. The carnage did not stop, however, as the Texans continued to use rifle butts and bayonets to kill the enemy in a furious retaliation for the brutal deaths of up to 275 Texans at the Alamo on March 6 and the massacre of nearly 350 at Goliad on March 27. Although the Twin Sisters secured their place in history, their travels did not end at San Jacinto. After being moved to Austin, probably to help protect the frontier capital from Indian attack, the two cannons appeared again on April 21, 1841, when they were fired to celebrate the fifth anniversary of the Battle of San Jacinto. Later that year, as Sam Houston kissed the Bible at the conclusion of his inauguration for his second term as president of the Republic of Texas, the cannons roared to life in a salute to the new president and hero of the Battle of San Jacinto. The Twin Sisters made no further public appearances and became part of the military property moved in 1845 to the federal arsenal at Baton Rouge, Louisiana when Texas joined the Union. However, when secession talk reached full tilt with the election in 1860 of Abraham Lincoln, Benjamin McCulloch who as a young man had served on the crew manning the Twin Sisters and was destined to become a general in the Confederate Army, sent a letter to then Governor Sam Houston asking him to bring the Twin Sisters back to their home in Texas. In the years after the cannons reached Louisiana, the Twin Sisters had been sold as scrap iron to a foundry. An investigation found that one cannon remained at the foundry in poor condition and the other had been sold to a private individual. The Louisiana legislature purchased and repaired both cannons at a cost of $700 and returned them to Texas on April 20, 1861, the twenty-fifth anniversary of their first skirmish with the Mexicans at San Jacinto. The Twin Sisters performed again on January 1, 1863, Battle of Galveston in which Confederate forces beat the Union Navy to regain control of Galveston Island. 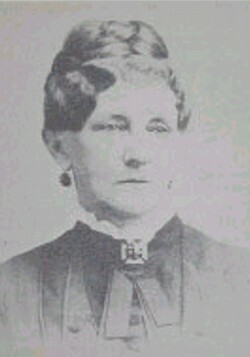 During that fight, Lt. Sidney A. Sherman, whose father had been one of the heroes at the Battle of San Jacinto, was killed while commanding one of the Twin Sisters. Stories abound about what happened to the Twin Sisters after the Battle of Galveston. One account says they were sent to Colonel John “Rip” Ford in San Antonio as he began the march south to recapture the Rio Grande from federal troops, but no record exists of the cannons reaching San Antonio. Some veterans claim to have seen the Twin Sisters at various locations around the Harrisburg area of Houston. Another account credits several Confederate veterans, concerned the Twin Sisters would fall into the hands of the federal troops during Reconstruction, with burying the cannons in an area hugging Buffalo Bayou. For years, history buffs and the curious have searched without success for the burial site. In 1985, two graduates of the University of Houston’s College of Technology supervised the construction of replicas of the Twin Sisters. They stand today on the San Jacinto Battleground State Historic Site waiting for a discovery that will return the original Twin Sisters to the location where they made Texas and world history. Stephen F. Austin fits the image of a reluctant father. He came to Spanish Texas in response to his own father, Moses Austin’s, deathbed wish for Stephen to continue with Moses’ dream of settling 300 families in Texas. Like many apprehensive fathers, Stephen F. Austin embraced his responsibilities and spent the remainder of his life guiding his colony and all of Texas toward its best opportunity for success. Austin understood and admired the adventurous, hard-working settlers willing to move to a wilderness and carve out a new life because he grew up around the French Canadian, Spanish, and American mine workers in the primitive, lead mining towns his father founded in western Virginia and Spanish Louisiana (present Southeast Missouri). 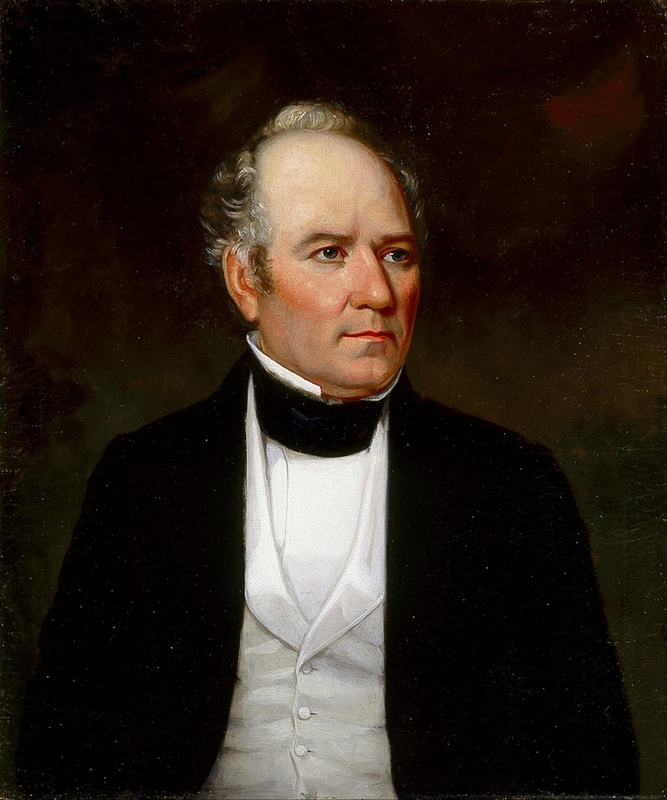 Unlike Moses Austin whose quick temper and need to challenge those with whom he disagreed, Stephen embraced patience, tact, willingness to compromise, and the diplomacy necessary to work with the independent-minded settlers and with the tangles of Spanish and Mexican government bureaucracy. Stephen reached San Antonio in August 1821, secured authority to continue with Moses Austin’s colonization grant, and arranged for allocating 640 acres for each man, plus 320 acres for a wife, 160 acres for each child, and eighty acres for each slave at a cost of twelve and a half cents per acre to be paid to Austin for administering the surveys and expenses of establishing the colony. Settlers eagerly grabbed the land offer as Austin scrambled to find financial partners. From the beginning of his colony, Austin insisted all land grants be carefully recorded in bound volumes to preserve a permanent record—a wise decision in light of the news of Mexico finally winning its long battle for independence from Spain. The first test of Austin’s diplomatic prowess came in December 1821—the first settlers were already arriving—when Mexican authorities refused to approve the terms of Austin’s Spanish land grant. He left immediately for Mexico City, and after patient negotiation, the Mexican government established a new empresarial policy offering each married man a league of land (4,428 acres) and opened colonization to several more empresarios, agents like Austin who received permission to bring settlers into Texas. The law denied empresarios the right to charge administrative fees, providing instead 67,000 acres for settling each 200 families. However, empresarios received their payment in land only after settling all the families. Imagine trying to sell land to colonists that were getting it free in Mexican grants. Despite the loss of administrative fees and personal debts mounting as he bore more and more of the unforeseen costs of establishing the Austin Colony, by late 1825, Austin’s colony reached 300 families—known today as the “Old Three Hundred.” Between 1825 and 1829, Austin settled an additional 900 families. Dealing with the Mexican government required constant compromise. The slavery issue presented a continuing challenge since most settlers came from slave-holding states and the original colonization law allowed them to bring their chattel into Texas. When the new constitution of the state of Coahuila and Texas prohibited slave importation, an uproar spread through the colony. Austin’s personal beliefs (he owned a slave woman he described as old and not worth anything) seemed to shift. As with other issues that he felt represented the best interest of the colonists, he negotiated a scheme allowing settlers to free their slaves at the Texas border and make them indentured servants for an indefinite time. Recognizing the plight of many colonists who came to Texas without paying their debts in the United States, Austin secured a law closing the courts for twelve years to debt collectors and permanently exempting land, tools, and implements used in business and farming from creditors—an early version of the homestead exemption law. Austin located his colony in fertile farmlands with access to transportation along the Colorado and Brazos rivers, and then lobbied the Mexican congress to legalize the port of Galveston and to allow trade through ports at the mouth of the Brazos and other rivers. Despite Austin’s efforts to ease tensions between the differing cultures and remain aloof from Mexican government intrigues by encouraging the colonists to “play the turtle, head and feet within our own shells,” outside forces kept Mexican officials on the defensive. Several offers from President Andrew Jackson for the United States to buy Texas drew Mexican suspicion that the U.S. was plotting to take Texas, which resulted in an 1830 Mexican law halting further colonization by settlers from the United States. Again, Austin wrangled an exemption for his and for Green DeWitt’s colony, and by the following year succeeded in getting the law repealed. However, when Haden Edwards, in an effort to win Texas independence from Mexico tried to drag Austin’s beloved colonists into the Fredonian Rebellion in late 1826, Austin sent a militia to put down the revolt and save his settlers from the wrath of the Mexican government. The colonists’ dissatisfaction with Mexican President Anastacio Bustamente’s heavy-handed immigration controls and introduction of tariffs finally led to Austin joining the colonists in supporting Antonio López de Santa Anna in the Mexican presidential elections. Santa Anna soon proved not to be the liberal leader of his campaign, but a dictator who clamped down on the increasingly independent-minded colonists. Austin did not favor the conventions held in 1832 and 1833 to express Texan grievances, and believed they would not serve the colonists’ best interests, but he attended each event hoping to moderate the actions of the increasingly rebellious settlers. Despite his efforts to temper the resolutions, the delegates, even those who disagreed with Austin, recognized his influence with the Mexican authorities, and elected him to present their petitions of grievance to the government in Mexico City. Austin’s negotiations resulted in important reforms, but as he headed back to Texas, Santa Anna ordered him arrested and held until July 1835—an absence from Texas of twenty-eight months. During that time Austin recognized that independence would be the only answer for Texas. Strong factions organized a consultation to begin the process of declaring independence. The consultation delegates selected Austin and two other men as emissaries to the United States to solicit loans and volunteers and to arrange credit for munitions and other equipment, including warships. The men were also charged with getting a commitment of recognition of Texas independence and eventual annexation to the United States. By the time Austin returned to Texas in June 1836, the celebrated Battle of San Jacinto on April 21 had decisively won the Texas war for independence from Mexico. Austin “offered his services” as president of the republic in the September election, but it was not to be. Sam Houston, the man who marched across Texas with the army, the flamboyant general who led the troops in the winning Battle of San Jacinto, won the contest. President Houston appointed the quiet and unassuming Austin to the office for which he was well suited—Secretary of State. Austin died at age 43 without knowing his beloved Texas, which he nurtured and guided with such patience, would become the twenty-eighth state to enter the Union, and that annexation would trigger the Mexican War (1846-48). Like dominoes falling across the historic landscape, the Treaty of Guadalupe Hidalgo ending that conflict stretched the United States borders to the Pacific Ocean, adding nearly a million square miles and increasing the size of the nation by almost one third. I usually try to tell the tale and let readers make up their own minds about the merits of the case. This time, I am admitting up front that I am siding with the state of Illinois against my own birthplace of Texas. Here’s the conundrum: The Illinois State Military Museum owns and proudly displays Santa Anna’s artificial leg and the San Jacinto Battle Monument and Museum wants it. The story goes like this: In 1836, after General Santa Anna won the Battle of the Alamo and had the survivors slaughtered and then ordered the massacre of about 300 Texans at Goliad, he marched in glory toward San Jacinto where he expected to defeat those “land thieves,” once and for all. His hubris, his view of himself as the Napoleon of the West, caused him to leave the bulk of his army behind and rush to San Jacinto. He lost the battle at San Jacinto in eighteen minutes, which gave Texas its independence from Mexico. Actually, he didn’t lose; he ran off and was not discovered until the next day cowering among some marsh, dressed as a common soldier. When the Mexican government heard of the fiasco, the officials promptly kicked him out of office as president of Mexico and commander of the Mexican Army. Consequently, Mexico claimed that Santa Anna did not have the authority to sign the peace treaty that declared Texas independence. Santa Anna was not done. After a time of exile in the United States, he made his way back to his hacienda in Veracruz. In December 1838, the Mexican government had refused to compensate French citizens for their financial losses in Mexico, and the French Army landed in Veracruz demanding payment. Mexican officials called on none other than the disgraced Santa Anna to defeat the French, using any means necessary. The assault failed, and as the Mexican Army was retreating, cannon fire hit Santa Anna in the leg, shattering his ankle. His leg had to be amputated, and that was the vehicle Santa Anna rode on his return to Mexican politics. Despite Mexico having to meet the French demands, Santa Anna turned defeat in victory by having his amputated leg buried with full military honors. He never again allowed his countrymen to forget his great sacrifice. Santa Anna turned to the only man in the United States that made artificial legs. Charles Bartlett, a former cabinetmaker from New York City, crafted for $1,300, a prosthetic leg of cork covered in leather. Santa Anna’s $1,300 cork leg with leather cover. While serving as acting president of Mexico in 1841, he helped overthrow the government. After four years under his dictatorship, during which he sent military expeditions into the Republic of Texas, his autocratic rule caused so much resistance that he was forced into exile in Cuba. Santa Anna was not done. At the beginning of the Mexican-American War in 1846, Santa Anna made a deal with President James Polk to enter Mexico through the U.S. naval blockade in exchange for negotiating a reasonable price for the sale to the U.S of the disputed land. While dealing with President Polk, Santa Anna arranged with Mexico’s president to lead an army against the northern invaders (that is the United States). Both presidents agreed to Santa Anna’s deals, and as soon as he reached Mexico he declared himself president and began leading the Mexican Army in its unsuccessful fight against the United States. On April 18, 1847, in the midst of the Mexican-American War, Santa Anna was sitting in his carriage enjoying a chicken lunch a safe distance from the fighting, when Company G, 4th Regiment of Illinois Volunteers surprised him. The General got away, but he left behind his cork leg and $18,000 in gold. The story is that the men finished off the chicken, turned the gold over to their commander, and took the leg with them back to Illinois at the end of the war. For years they charged the curious, ten cents a viewing of the leg. In 1922, it was donated to the state. 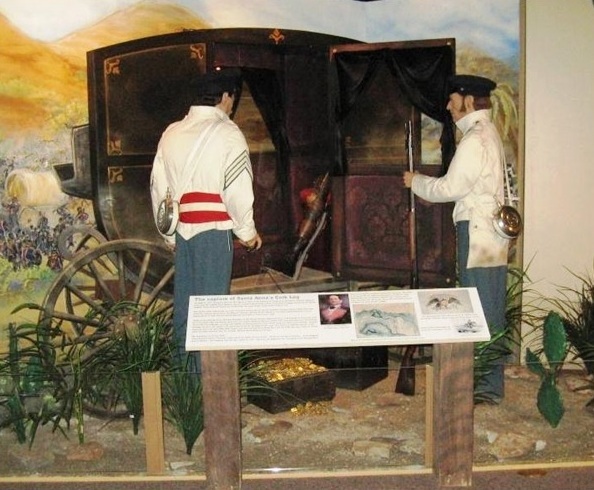 Today, Santa Anna’s leg is the central attraction in the Illinois State Military Museum in Springfield. The challenge came in April 2014 when the San Jacinto Battle Monument and Museum launched a petition on the White House website seeking 100,000 signatures to get the leg moved to Texas. There were not enough takers to qualify for the White House to look into the cause, however, it is hard to imagine that a president from Illinois would step into a move to take a prize from his state and send it to Texas. If I had been asked to vote, and I was not, I would say Santa Anna’s artificial leg belongs to Illinois. While Santa Anna was a bitter enemy of Texas and continues to be held in low esteem, he had both his good legs while he was in Texas. Those Illinois volunteers found that leg eleven years after Santa Anna foolishly led his men to defeat at San Jacinto. ladies, except for one, Anna Raguet. The well-educated Miss Raguet was fourteen in 1833 when she moved with her father from Cincinnati to Nacogdoches, which was still part of the Mexican state of Coahuila y Tejas. Marquis James, Houston’s biographer says in The Raven that Anna’s father Henry Raguet was a merchant and landowner, and provided the best house in Nacogdoches for his family where they entertained extensively. Anna, the apple of her father’s eye, played the French harp in the parlor and translated Spanish, especially for the young men in the area who wanted to improve their correspondence with the Texas Mexican government. And, like the forty-year-old Sam Houston, enjoyed the company of the charming young Anna. To clear the way for a serious courtship, Houston hired a divorce lawyer who failed to get the decree because divorce was against the law in Mexico. Even as Houston began his law practice, hobnobbed with Nacogdoches society, and became deeply involved with the political faction seeking Texas independence from Mexico, he pursued his courtship of Anna through letters and his gentlemanly manners. Houston was the hero of the day after San Jacinto and easily won election as the first president of the Republic of Texas. In the midst of the challenges of organizing a new government, he did not return to Nacogdoches for several months. Instead, he worked out of a shack on the banks of the Brazos River in the temporary capital of Columbia and tried to continue his courtship of Anna Raguet by mail. She had ignored the laurel of leaves and card sent from the battlefield of San Jacinto. To avoid gossip that would surely reach her in Nacogdoches, Houston refrained from socials engagements as much as possible and stayed away from alcohol. In early 1837 Houston wrote Irion: “Salute all my friends and don’t forget the Fairest of the Fair!! !” Again Houston wrote: “Write . . .and tell me how matters move on and how the Peerless Miss Anna is and does! I have written her so often that I fear she has found me troublesome, and . . .I pray you to make my apology and . . .salute her with my . . .very sincere respects.” While Houston waited for letters that did not come, he received regular reports of Miss Anna nearing the steps of the altar, although no one seemed to know who the fortunate fellow might be. Ignoring the laws under the Republic of Texas that required an Act of Congress to secure a divorce, President Houston empowered a judge to quietly hear the case in his chambers and issue the decree. The version of the divorce story that Anna Raguet received was apparently all it took to settle any doubts she may have harbored. The one-sided romance came to an end.